Ideally suited for fixed installation, such as ceiling-mount installation. Designed for large-screen projection in large spaces and bright rooms. 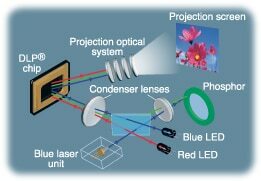 Adopting a new semiconductor light source system combining a laser and an LED has achieved both higher brightness than conventional LED projectors can offer and superior eco-friendliness as compared with mercury lamp models. CASIO’s Hybrid Light Source enables mercury-free projection with excellent brightness characteristics. Hybrid Light Source achieves a high level of brightness without the use of high-pressure mercury lamps by employing a laser and an LED: red by adopting a high-brightness red LED; green by using phosphor to convert blue laser light; and blue by adopting a high-brightness blue LED* . * Blue generated by a blue laser unit available in XJ-A series and XJ-M series. The light source’s life of approximately 20,000 hours far outshines that of conventional projectors that require mercury lamp replacement. It saves maintenance labor and contributes to a significant reduction in operating costs. Since brightness degradation is more gradual than with mercury lamps, moreover, it maintains vivid image quality through long-term use. Projection at maximum brightness is achieved in as few as five seconds, and the time from startup to screen display is shortened dramatically, facilitating more effective use of limited time. No cooling down is necessary, moreover, when the power is turned OFF. Users can complete the process from setting up to packing up smartly and speedily. The dramatic improvement in color purity achieved by the new light source has significantly improved color reproduction. Not only are the colors clearer and more beautiful, but the projected images also look brighter due to the visual effects of the high-purity colors. Users benefit from clearer, more powerful images than conventional projectors can achieve. These models achieve brightness as high as 3500 ANSI lumens without a mercury lamp. This enables large-screen projection in large conference rooms as well as clear projection of images in brightly lit rooms. It also contributes to combined use of the screen with other presentation materials and smooth communication between the presenter and the audience. A 10W monaural speaker installed in the projector permits powerful sound output without an external speaker. A DLP® 3D projection function* adds a stereoscopic image projection capability, facilitating highly persuasive presentations with impressive audio and visuals. Note: Separately available 3D Glasses for CASIO Projectors (YA-G30) are required for 3D image viewing. See Options. 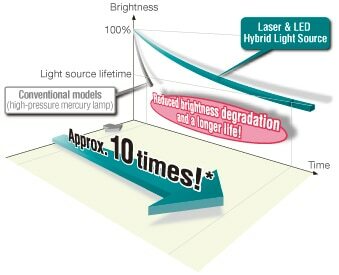 The long-life semiconductor light source reduces maintenance labor and costs dramatically as compared with conventional models that require mercury lamp replacement. The resulting convenience is particularly apparent in cases of fixed projector installation with a ceiling mount. A mouse-compatible interactive pointing function* supporting writing on the projection screen enables presenters to use the screen just like a whiteboard. A MobiShow®* compatible wireless LAN function permitting wireless communication with PCs and smart phones and a USB 2.0 host function* enabling PC-free presentations add further presentation possibilities for a variety of circumstances, from business meetings to seminars and conferences. Note: Separately available Interactive Pointer (YA-P10) required for use of the interactive pointing function. See Options. Two input terminals and one output terminal provide full PC connectivity. An HDMI terminal facilitates high-quality image presentations and a composite terminal supports connection with AV devices. Convenient control terminals handle such remote operations as power ON/OFF. *1 When using Bright mode. *2 Wireless adapter included (for use with USB terminal installed at the rear of the projector). *3 This function requires CASIO’s Interactive Pointer, sold separately. *4 Metal ceiling-mount fittings required. Installation work charged separately.